What is Blue Captcha's current version? Which versions of WordPress does it support? Can i have a sample of what this plugin can do? 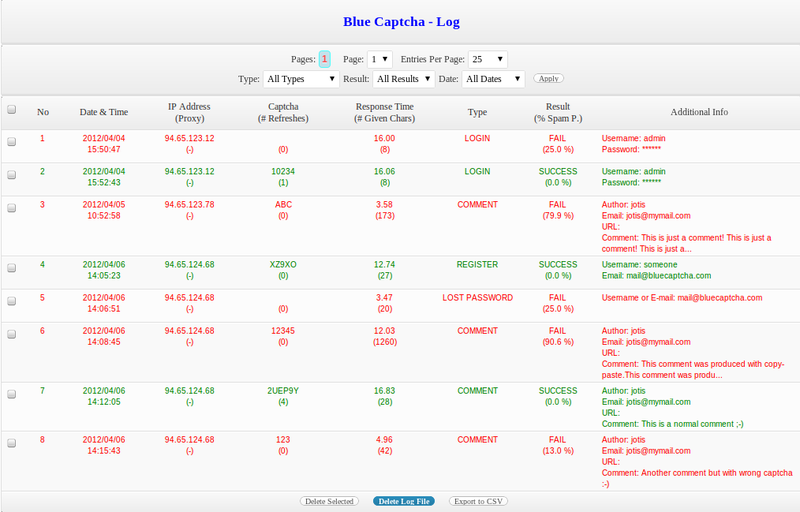 Blue Captcha is a powerful WordPress Plugin that pretects your WordPress blogs from spammers and unwanted persons. It's easily installed in your favorite blogs and is highly customized. 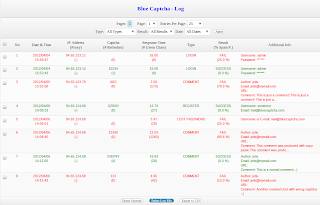 Blue Captcha's current version is 1.7.4, released on June 6, 2015. WP 2.8.6 or any later version. It is possible to "fit" into some earlier versions but it has not tested yet. The plugin has been successfully tested on WordPress 2.8.6, 3.0, 3.2.1, 3.3.1, 3.4, 3.4.2, 3.5 and 3.6. NOTHING. The plugin is absolutely free. Sure. Here is some screenshots. 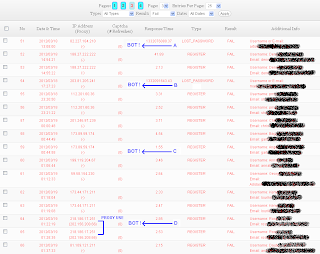 Screenshot of Log File as it is in version 1.2. Blue Captcha also indicates the number of total characters entered by the user as well as the spam probability. Hall of Shame (HoS). Blue Captcha provides you with some important stats of all IPs' activity, thus making it clear who the real spammers are. You are now able to easily decide which IPs to ban, if you want to. 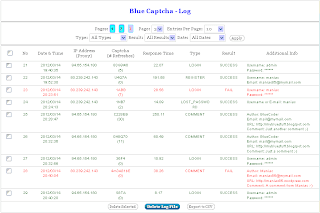 Keep Captcha Data In: Blue Captcha provides two ways of storing Captcha Data (sessions). The first way is through PHP SESSIONS while the second one (and the most secure) is through a Database table. It's highly recommended that you select the second way (Database). Extra Protection Key: Extra Protection Key is a random 16-character string used as a "salt" in order to further protect your Captcha Data (of course they are encrypted themselves, but Protection Key adds a little more security). Protection Key is important especially when you use the first way of storing Captcha Data (SESSIONS). If you want to generate a random Protection Key on the fly, just click on 'Generate New Key' button. Of course you can enter your own Key, but it's recommended that you let Blue Captcha generate a random Key daily for you. Auto Generate New Key Daily: Blue Captcha is able to automatically generate a random Protection Key daily. Just select 'Yes' (default) to do this. For even more protection, it's good to have a different Protection Key every day (especially if you use 'SESSIONS' to store Captcha Data). So why don't you let Blue Captcha do this job for you? 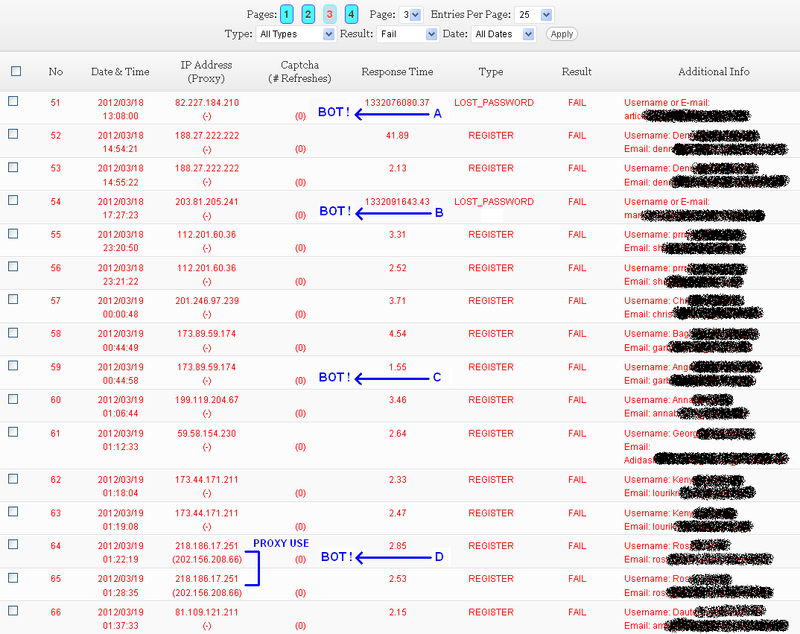 Through blocking options, you can permanently block the IP addresses of "regular" visitors which seem to be spammers, bots or just unwanted persons. 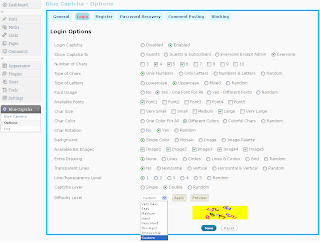 Blue Captcha Plugin is able to keep log file and register all activities concerning user logins, user registrations, user comments and password recovery attempts. 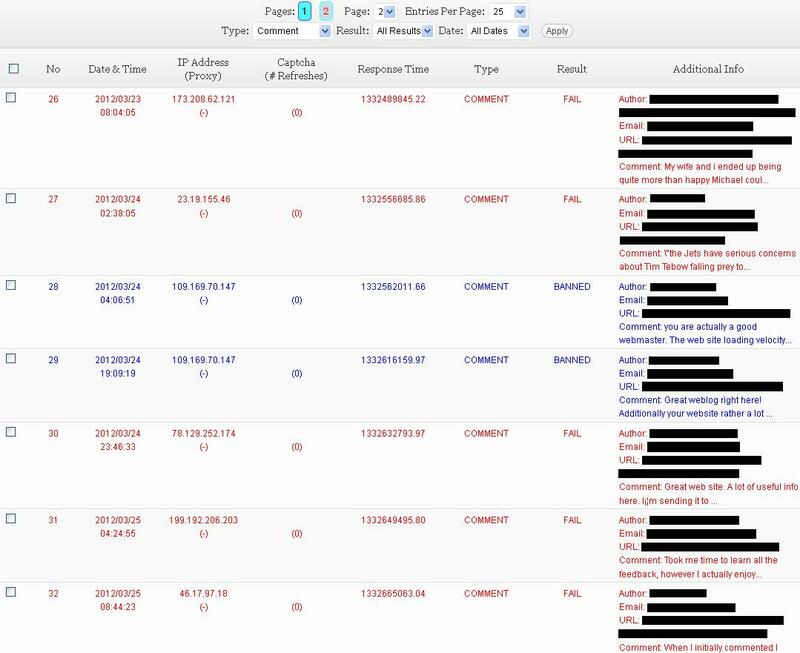 With the help of log file, you can spot spammers, bots and any "suspicious" activity. 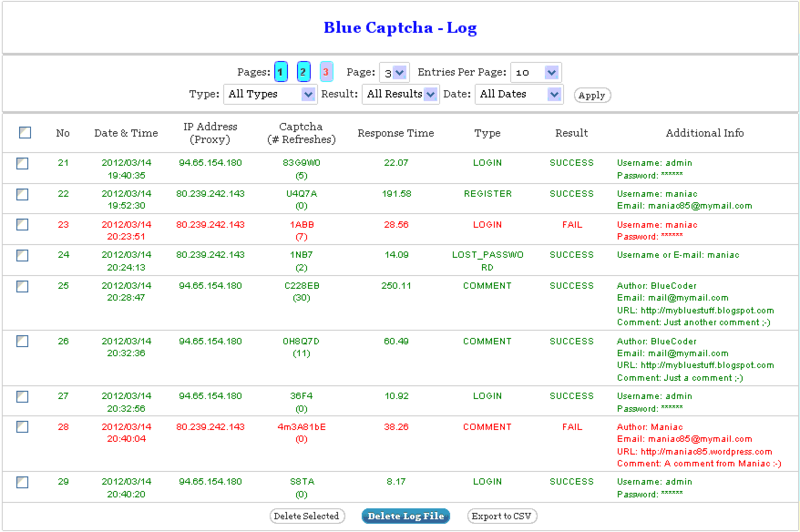 Accordingly it is highly recommended that you enable keeping log file through Blue Captcha's options. You can go through log file pages with page navigation system located in the up side of the plugin webpage content. Note that you can select how many entries you want to be displayed per page. Also, you are able to add filters (type or result) and see only the logs of a specific date. Below you can find description of log file table columns. Needless to say that 'Captcha (#Refreshes)', 'Response Time (# Given Chars)' and -of course- Spam Probability Estimation are the most important indicators as they can provide you with significant clues about spam bots attempts. If you want to delete some log entries, just check them and click on 'Delete Selected' button. You can erase the entire log file by clicking on 'Delete Log File' button. Moreover, Blue Captcha gives you the opportunity of exporting the entire log file into a CSV file. Just click on button 'Export to CSV' to do this. This capability is secure because only administrators can export log file to CSV. So don't be afraid of this capability because it's impossible for unauthorized persons to "steal" your log file. Blue Captcha Plugin has a section called "Hall of Shame" (HoS). This section keeps stats about all IPs having interacted with captcha entries. Below you can find description of HoS table columns. WordPress has a lot of Themes and each Theme has different "structure" than the others. 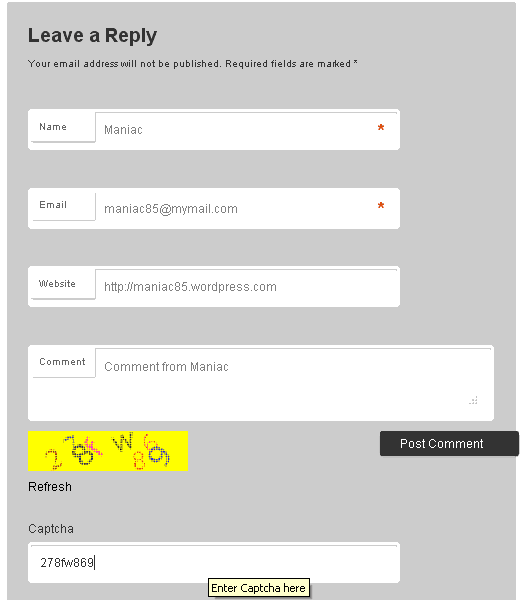 On most themes, Captcha is displayed properly on Comment Form. Unfortunately, on some themes, Captcha is displayed under "Submit" button and this may be annoying. 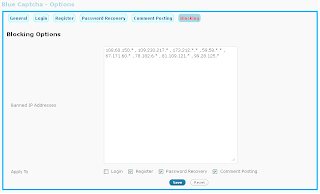 It is possible to "adjust" the location of Blue Captcha on comment form since Blue Captcha version 1.7. 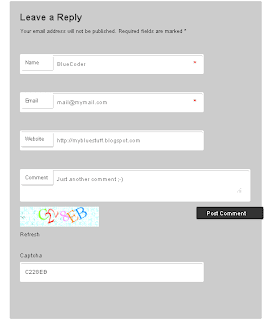 A new option (called "Captcha Location On Comment Form") was added in "General Options". This option provides the opportunity to position Captcha before or after a particular HTML element. This HTML element will be the textarea of comment. In order to use a different Captcha location, we need to select "Define At" choice. 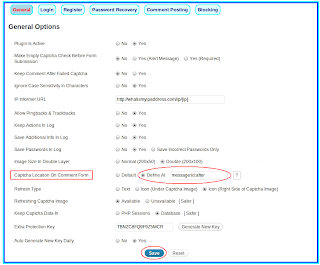 Then we have to define the name of the ID of comment textarea and choose whether Captcha will be displayed before or after this element (defined by the ID). 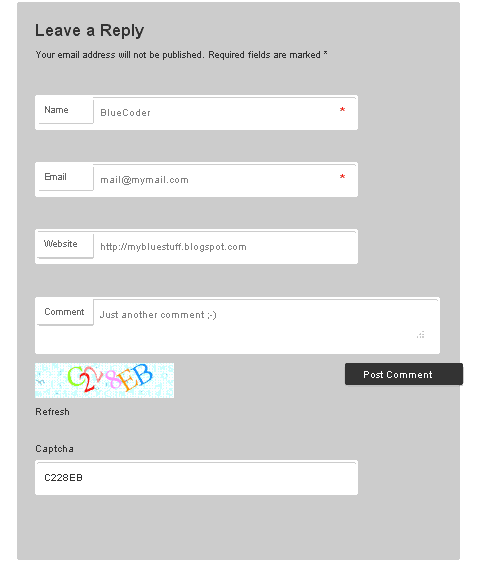 The ID of comment textarea is usually named as "comment" or "message" for most WordPress Themes. However, some Themes may have a different name for textarea ID. where xxxxx is the name of the ID (in our picture example, xxxxx is "message"). This one will work only if the textarea element is included in a <p> tag with class attribute "comment-form-comment" (this is the case with lots of WordPress Themes). I myself have managed to properly adjust Captcha location on more than 20 WordPress Themes with completely different structures. So I guess that you can do it too. 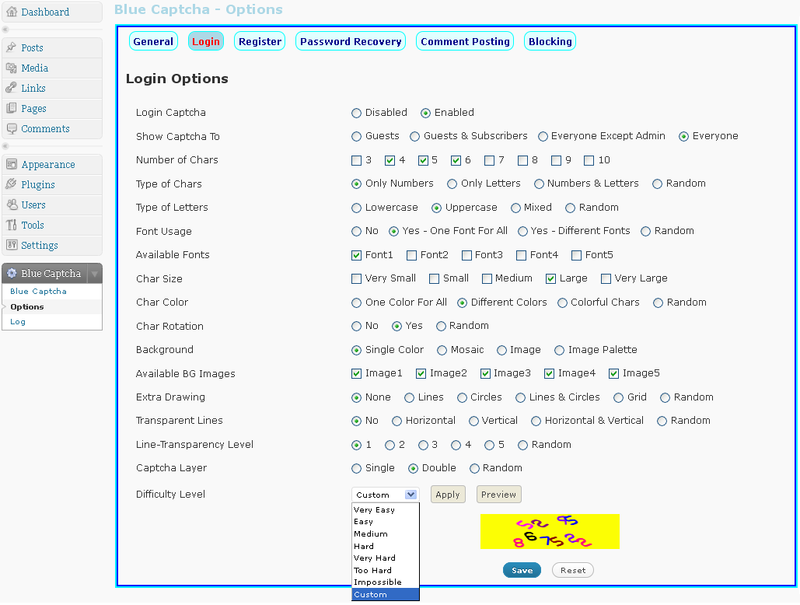 In case that you accidentally activated Blue Captcha on Login form and you can't access you blog as administrator because Blue Captcha cannot display images, you can log into cpanel and delete (or rename) the subfolder "blue-captcha" inside the "plugin" folder of your WordPress site. 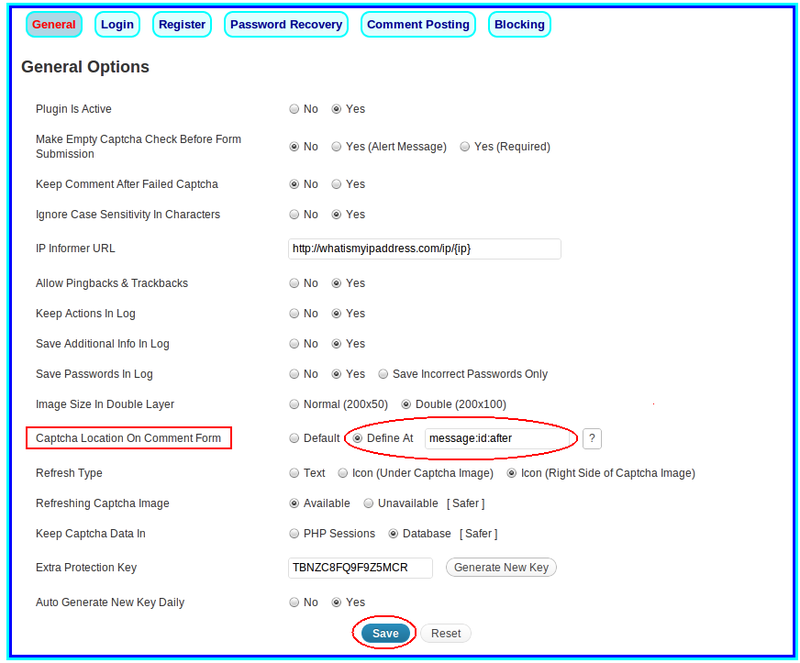 WordPress will automatically deactivate Blue Captcha plugin and then you will be able to normally access your WP blog again, and fix the problem regarding Blue Captcha plugin (you will need to reinstall Blue Captcha). Make sure that your blue-captcha folder (and its subfolders) have the appropriate permissions. Try investigating your folder's permissions - especially the permissions on "blue-captcha" folder and its subfolders. 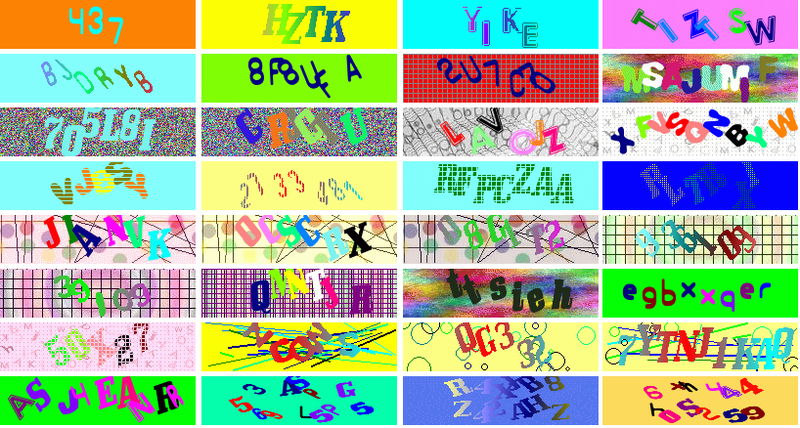 Some other plugin(s) may interfere with Blue Captcha causing malfunctions. Temporarily disable ALL other plugins on your blog and activate Blue Captcha only, without any other plugins (just to check if there is a problem concerning other plugins). 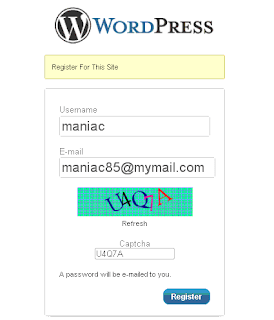 Test if captcha images & fonts are displayed properly both on Options page ("Preview" button) and on casual WordPress forms (i.e. on Registration form, Login form, Recovery password form etc). If Blue Captcha works fine now, then some other plugin is definitely interfering with Blue Captcha. Afterwards you can re-enable the other plugins, one by one. This way you will be able to find the incompatible plugin(s). Please let me know in case you discover any incompatible plugin.